A while ago I provided a friend with a list of all the flights that I have ever taken and he blogged about comparing our CO2 emissions. The flight map that he created for himself got me wanting to make a similar one for myself. 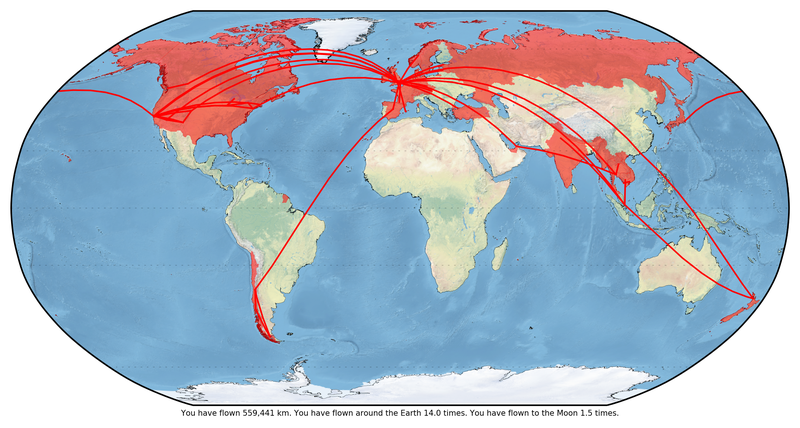 I decided to write a Python module to create similar flight (and travel) maps for anyone: FMC (Flight Map Creator). The module provides a function that reads in a CSV file of flight data (pairs of IATA airport codes) and plots great circles on a map. To convert IATA airport codes into coordinates the GitHub repository of OpenFlights is used. It additionally shades in the country that the airport is located in as well as any other countries you wish to shade in manually (for instance, those that you have visited without flying to).